Food and feasting is at the centre of our Christmas celebrations, and folklore and customs play an important part in what we eat. It may appear that much of the folklore associated with Christmas has been buried underneath what is an increasingly commercialised and secular holiday, but dig a little deeper and, although some of the customs and folklore have changed, they are still being practised by many today. Making the Christmas pudding mix is a whole family affair. Part of this is probably because the mixture is very stiff and heavy and stirring it may be too much for one person. Everybody takes it in turns to stir the mixture. Traditionally each person stirs the mixture three times in an anti–clockwise direction. This is supposed to symbolise the journey of the Three Wise Men from the East to Bethlehem. As each person takes their turn to stir they are all supposed to make a wish. Mince pies (whether they are bought or made) are eaten throughout the whole of the Christmas holiday period. In the medieval period mince pies were made with real mince meat and the pastry was shaped like a crib – sometimes they even had a little pastry infant Jesus on top. During the Commonwealth period between 1640 and 1660 such ‘idolatrous’ practices were banned by the Puritans. After the crown was restored the mince pie came back too but it began to change. It become the circular shape we are all familiar with and the meat in the mince meat disappeared and was replaced by a spicy dried fruit mixture. Yet some of the customs and folklore attached to mince pies are still observed in many parts of the country. If the mince pies are homemade then the mince meat should be made from twelve ingredients and thirteen mince pies (a ‘baker’s dozen) are baked. Thirteen represents the twelve apostles plus Jesus. One of the thirteen mince pies, which represents Judas Iscariot, is then thrown away. One mince pie is supposed to be eaten every day of the twelve days of Christmas and it is considered bad luck to refuse a mince pie if you are offered one. There are many pagan, Roman and Celtic hangovers in our Christmas celebrations such as the use of greenery in decorations and even the date of Christmas itself. 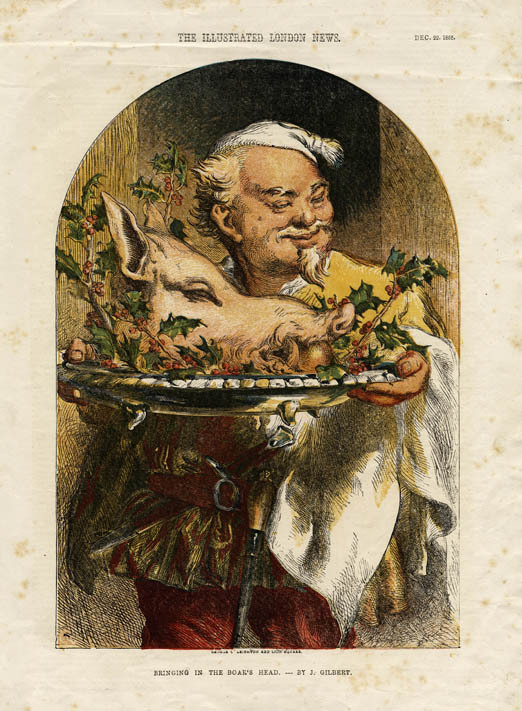 The Roman custom of serving boars’ heads at major celebrations was carried on during medieval Christmases before it was taken over by roast beef, goose and later turkey. The boar’s head also plays an important role in Celtic mythology. Although we do not eat boars’ heads at Christmas we can see a faint echo in the pigs in blankets that we serve with the main dish of the day. The ceremony of bringing in the cooked boar’s head is still celebrated in a few places such as Queen’s College in Oxford and at several universities in the United States. 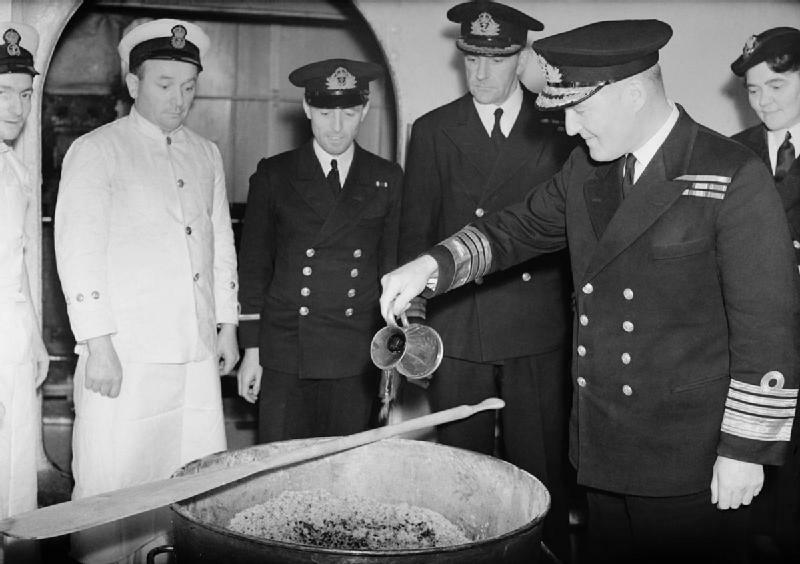 Christmas Day is also the day when the Christmas Pudding made on Stir–Up Sunday is finally eaten. The tradition of flaming the pudding with some heated brandy harks back to winter solstice celebrations. Inside the Christmas Pudding are small coins which are supposed to bring wealth and good luck to whoever finds them. 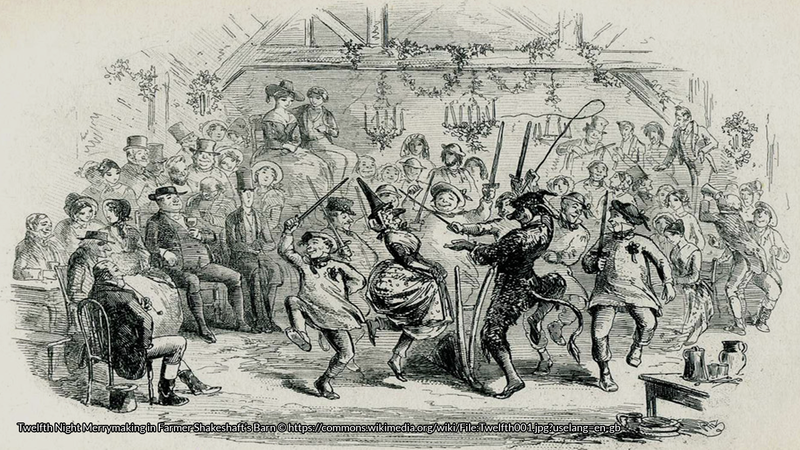 The Christmas holiday traditionally lasts for twelve days and finishes on Twelfth Night. This is the day of the Epiphany when the three kings arrived in Bethlehem. Surprisingly there is some difference of opinion about when Twelfth Night actually is. It is either the night of the 5th or 6th January. In pre–industrial times this was the night when the Christmas holiday was over and everybody had to return to work the next day. The celebrations on this night became notorious for their raucousness and consumption of alcohol. It was also the last night for the appearance of the ‘Lord of Misrule’ when social conventions were turned on their head. The arrival of industrialisation, populations moving to the cities and Victorian efforts to turn Christmas into a more sedate and family–orientated holiday marked the death–knell for Twelfth Night celebrations. Again there is a faint echo today as many people take down their Christmas decorations on Twelfth Night, considering it bad luck to leave them up any longer. At the centre of Twelfth Night celebrations is the Twelfth Night cake. This was just a simple fruit cake with a gold paper crown wrapped about it. Inside the cake there is a dried pea and a dried bean. Whoever finds these dried items were crowned the kings and queens of the night and would be in charge of proceedings for the night. The Twelfth Night Cake slowly died in this country and was reborn in the Victorian period as Christmas cake. Very few people celebrate Twelfth Night with a cake now. The Drury Lane Theatre in London still celebrates Twelfth Night every year with a cake known as the Baddeley Cake. The cake is paid for with money left by the chef/actor Robert Baddeley in 1749. In 2017 it will be the cast and crew of Charlie and the Chocolate Factory who will continue this tradition. Many people continue to follow the customs and folklore of Christmas time without being aware that that is what they are doing. That includes the preparation and eating of Christmas food. Many of them are a mixture of a variety of beliefs from years gone by, and even though our beliefs have changed, the traditions inspired by them have not. I’m a freelance educational writer and consultant. 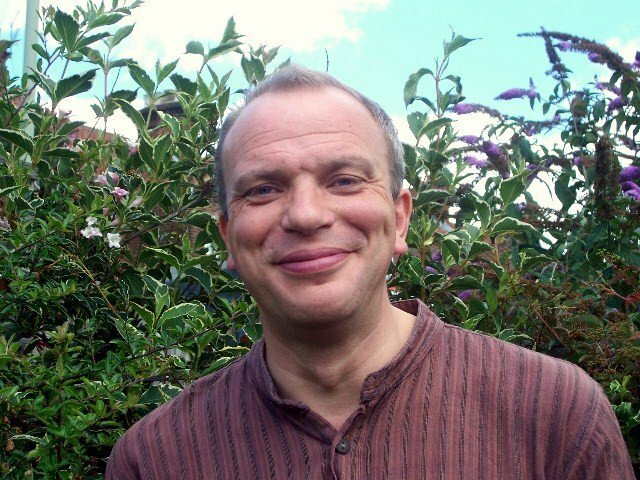 I’ve written over 30 non–fiction books for children and young people as well as scripts for the BBC and various magazines and websites.